For each of our stocked watches brands, we provide a full range of watch repair, servicing and refurbishment services. That includes Rolex, Cartier, Patek Philippe, Breitling, Tag Heuer, Omega, IWC, Zenith plus many more. 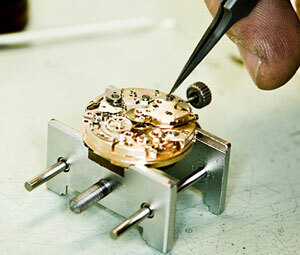 Specializing in the restoration of luxury wristwatches, vintage and pocket watches. The servicing of an automatic or a manual timepiece will include the disassembling of the movement to its component parts. Cleaning each part and reassembling. We provide this service for a wide range of other timepieces too. We have as selection of articles on the repair of your favourite luxury watch brands. We hope that you will find them both interesting and informative. Battery replacement 1 hour (or less). Battery & Re-seal Estimates to repair timepieces. Overhaul of quality mechanical, automatic and quartz including Rolex, Tag Heuer, Omega. Refurbishing and polishing case & bracelets. Here at Dawson Jewellers, we have sourced a magnificent choice of designer high-end watches for you to enjoy. Including both wristwatches and pocket watches. Our world beating selection are the perfect accompaniment to any wardrobe and for any occasion, whether that be business or pleasure. Fantastic for personal gifts, birthday presents, anniversaries or corporate gifts. Please call us with any special requirements you might have. Our highly trained staff are on hand to deal with and inquiry you might have. Here is an interesting video on watch repair. You can see from this the great deal of time and effort that goes into repairing these watches, to the highest of standards. Come visit us at to view our complete stock. For more information or any queries, please use our contact form or call us on 01-6624437.